Coleraine had a number of standout performances against Glentoran, but Darren McCauley in particular caught the eye. The silky wide man tortured the Glens rearguard all night scoring one and setting up another as the Bannsiders ran riot. Oran Kearney labelled the former Institute man as ‘unplayable’ after the game. The unassuming McCauley though told Times Sport that although he was pleased with his own performance he wants to get on the score sheet more often. “I’m very happy with my own performance, and obviously I’m delighted to get a goal,” he said. “I know that is something I need to improve on, I know I should be scoring more goals. “Overall though I’m very happy with my performance and the team’s. “I think that performance has been coming for a while now. “That’s the best we have played in a while to be honest. “We started the game very well and we continued that on into the second half and got the goals. 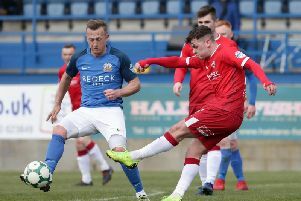 Two extremely positive performances on the bounce have lifted the mood at The Showgrounds following their embarrassment at Dungannon a fortnight ago. McCauley said they have put that behind them, but said the youthful stripes have to produce performances on a regular basis. “We’re not young boys any more, we’re men,” he said. “All the young players have really come of age and stepped up to the mark. “Now is the time to do it and we have to step up to the mark. “We have set the bar now and we have to keep aiming for that. “We’ve put the Dungannon game behind us. “We played really well against Crusaders last week so we wanted to build on that and get a bit of momentum. “Getting a settled team is a big part of it too. “We look as though we have got that now and that will help us get the consistency in our results. “Brad has come in and played very well in that central role, it looks like it is going to be his position. Boss Kearney was full of praise for his left-hand side star performers McCauley and Brown as they were involved in three of the four goals. “Darren was unplayable tonight,” said Kearney. “When he is on it like that there no one can touch him. “He linked up so well with Rodney Brown down that left-hand side. The Bannsiders boss was also delighted to see a new maturity in his side. Despite dominating the game they only went in at the break one goal to the good. Kearney though felt they went about their business in a very impressive way. “In the past it would have been a bit of a concern that we were only one goal to the good at half time, but you can’t always look at it like that,” he said. “The way the team is maturing is fantastic, I’m so proud of the young players tonight as they managed the game brilliantly. “I said to them at half time that they have to get into a mindset of not feeling sorry for themselves when they play so well but don’t score the goals. “I was confident that we could see the game out 1-0 if needed as we have the goalkeeper, the defenders we have the concentration so they didn’t need to be afraid to go on and win it 1-0. “In the same stretch I wanted them to be patient as I knew they would get chances up at the other end.